Monogamy is a mating system where partners live and exclusively mate with only each other. These pair bonds can be transitory, just for a single breeding season, extend for several years or even a lifetime. 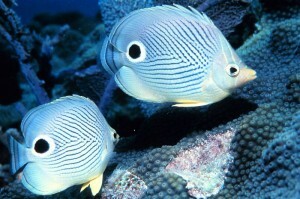 Fish that form strong pair bonds include: American freshwater catfish, some cichlids, and many butterflyfish. The Four-Eyed Butterflyfish (Chaetodon capistratus) is one such fish that mates for life – very rare in the fish world.